Simply come in and choose your items and colours, we will advise you which ones work best, then do your hand/footprints on your pieces(s) (Don’t worry, we do the hard part). You can then choose to either personalise the piece yourself or ask us to do it for you at no extra charge. Our paints are all non toxic and washable and simply wipe off with a babywipe. Looking for a longer term project. How about one of our growing plates. Come in regularly as your baby grows adding a footprint each time. At the end of baby’s 1st year you will have an amazing momento of that special time. 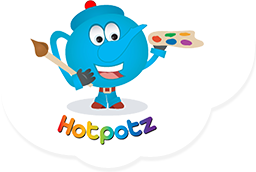 Why not ask Hotpotz to create a beautiful plaster impression of your baby’s hands and/or feet. We simply take an impression in a lovely soft moulding material from which we then create our plaster outprints. It is then coloured and finished by hand and framed in your choice if light wood, dark wood, white or black frames. Outprints are available as single or double prints. Booking is required to allow for preparation time and avoid unnecessary waiting. Please phone us on 0191 280 8181 to book a slot. Please allow 2 weeks for your finished article. 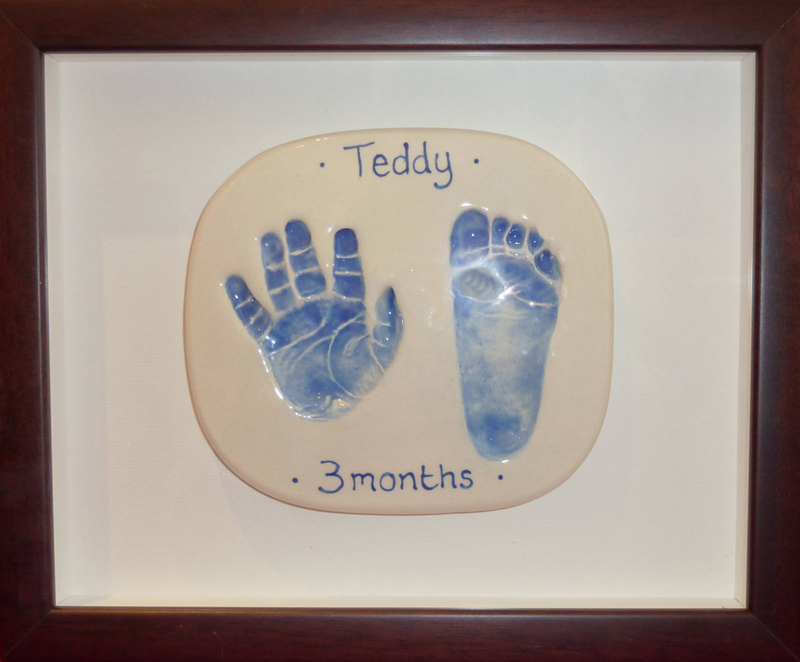 Our most popular keepsakes are our lovely clay impressions. 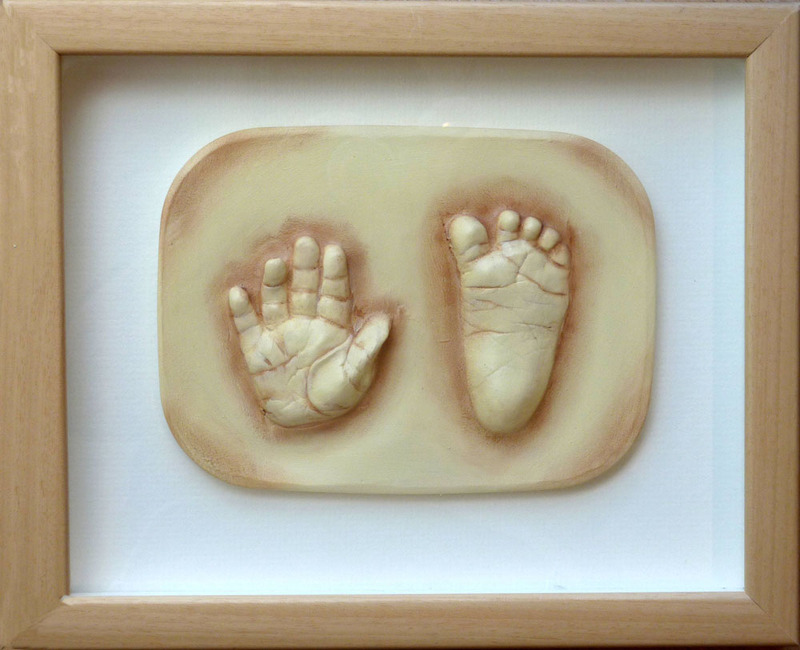 We make an impression of baby’s hands and/or feet in soft smooth clay in your chosen combination. You then choose your colours, text and frame. The clay is allowed to dry very slowly before firing. We then colour, glaze and refire the prints before framing them in your choice of light wood, dark wood, white or black frames. Booking is required to allow for preparation time and avoid unnecessary waiting. Please phone us on 0191 280 8181 to book a slot. Please allow four weeks for the finished article.